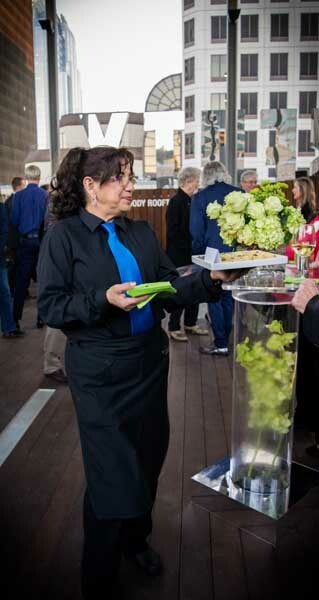 As supporters of the arts, it was a true honor to serve the Texas Medal of Arts honorees and advocates at their beautiful events during the two-day celebration last week in Austin. As supporters of the arts, it was a true honor to serve the Texas Medal of Arts honorees and advocates at their beautiful events during the two-day celebration last week in Austin. 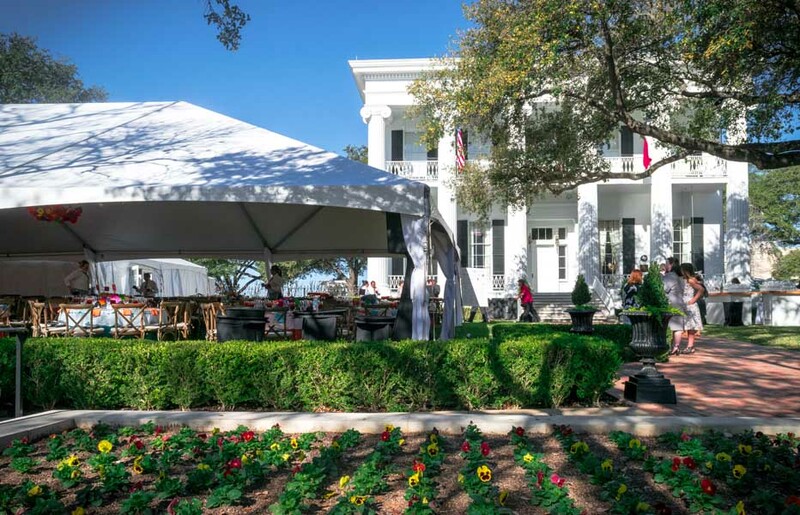 While every catering event is truly special to our team, few provide such unique opportunities to showcase our culinary art and passion before such a prestigious gathering of Texas most talented artists, or an event venue as historic as the Governor’s mansion! 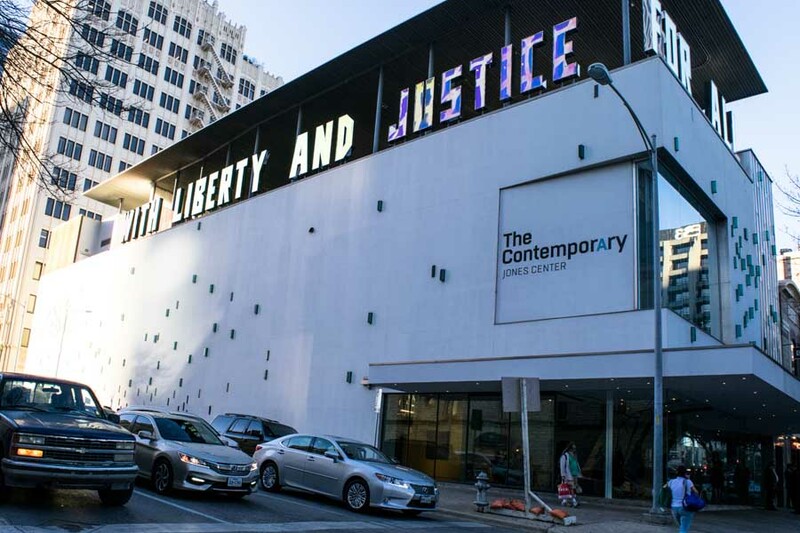 The Texas Medal of Arts Awards is a biennial star-studded event founded in 2001, which honors Texas’ diverse artistic leaders for their creative talents, as well as those whose benevolence has made way for artistic opportunity for Texans of all ages. 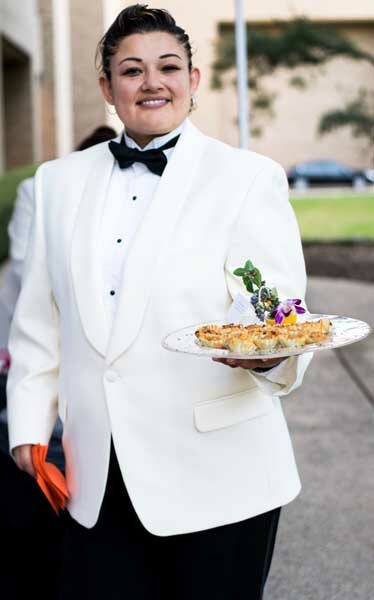 It was our distinct pleasure to serve savory bites & signature cocktails atop The Contemporary Austin museum present a three-course luncheon on the lawn of the Governor’s Mansion as well as the seated dinner for 850 at the Bass Concert Hall. 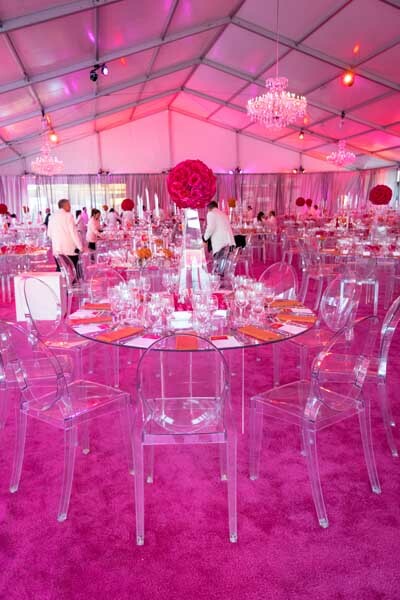 Our mission was to compliment the great mission, artists, venues and décor assembled, and hope every guest had a magnificent time. 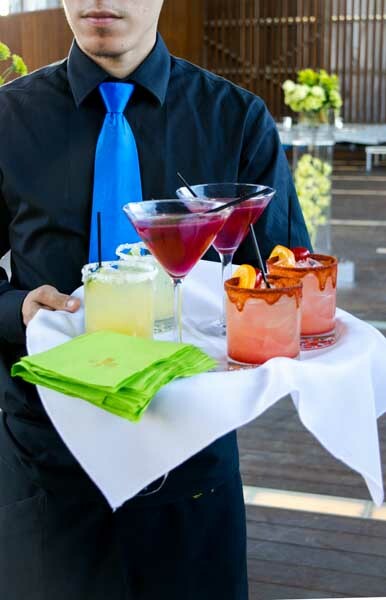 Serving savory bites & signature cocktails at The Contemporary Austin's Jones Center Moody Rooftop. Our signature cocktails for the evening included Sunset Margaritas with Chamoy & Prickly Pear Cosmos. Our Goat Cheese & Pine Nut Tarts were some of the savory bites we served guests at the Moody Rooftop. Presenting a three-course luncheon on the lawn of the Governor’s Mansion for the Texas Medal of Arts. 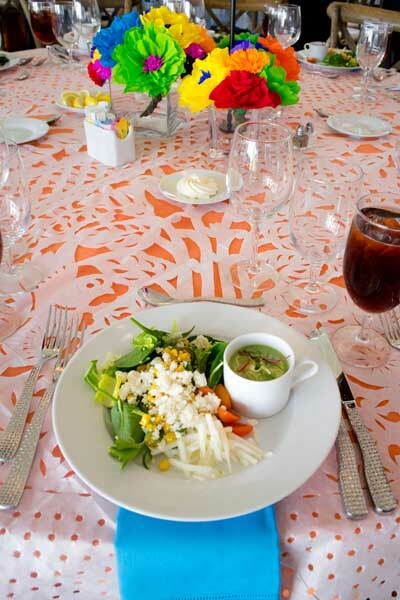 Our Rajas & Elote salad we served consisted of Heirloom Spinach topped with Rows of Jicama, Baby Tomatoes, Roasted Corn, Poblano Rajas & Queso Fresco with Chipotle & Honey Vinaigrette, accompanied by a Demitasse Cup of cool Avocado Bisque. 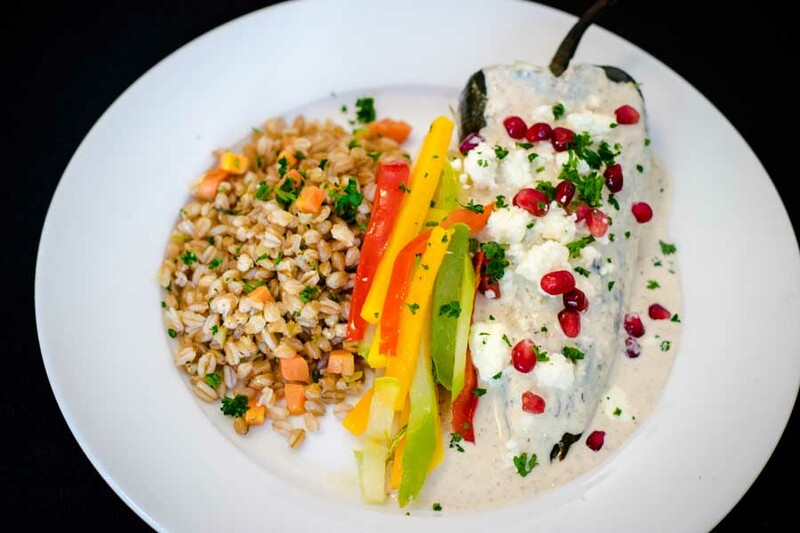 Our entrée at the Governor's Mansion Luncheon was Chiles En Nogadas: Fire Roasted Poblano filled with Savory Spiced Beef, Nuts & Fruit, topped with Creamy Walnut Sauce, Pomegranate Seeds & Fresh Farmers Cheese, accompanied by Chayote Guisada & Farro Pilaf. Our team getting ready to present a three-course dinner for 850 at the Texas Performing Arts' Bass Concert Hall for the Texas Medal of Arts Awards Show. Presenting the Texas Medal of Arts Awards Show guests with Bleu & Bosc Strudels: Caramelized Phyllo, Walnut Dust & Elderflower Syrup. 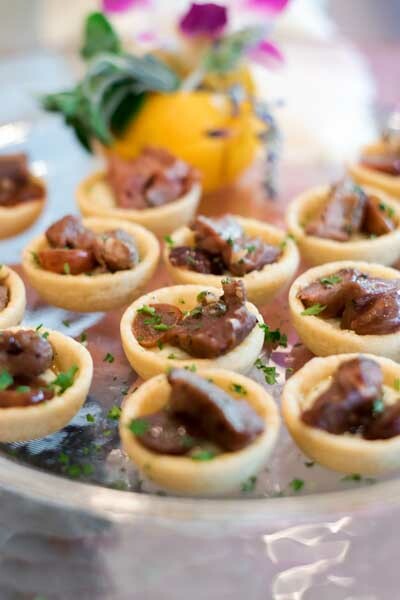 We also presented Beef Gorgonzola Tarts with Tender Shaved Beef, Gorgonzola Mousse & Oven Dried Grapes to the Texas Medal of Arts Awards Show guests. 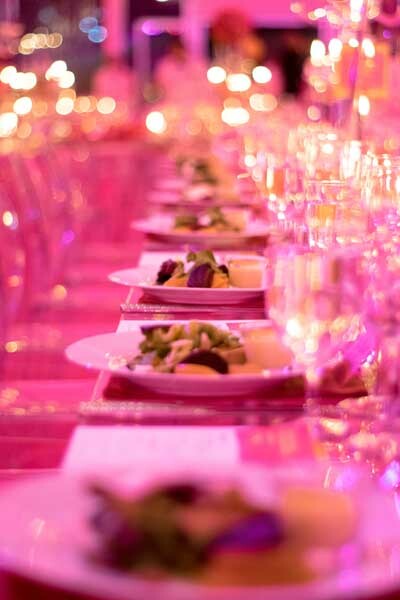 Slow Roasted Baby Beets, Grilled Artichokes, Tender Baby Greens, Toasted Pistachios, Ricotta Salad & Meyer Lemon Vinaigrette made up our Beets & Greens Salad at the Texas Medal of Arts Awards Show Dinner. 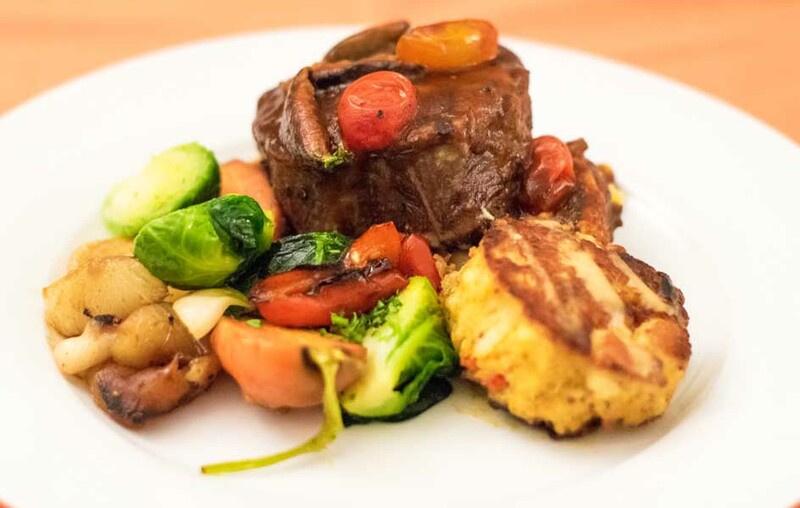 Presenting a Land & Sea Entree to guests of the Texas Medal of Arts Awards Dinner with a Char Grilled Filet of Beef with Sauce Chasseur & Gulf Coast Crab Cake, accompanied with Creamy Crab & Jalapeño Corn Pudding, Thumbelina Carrots & Crispy Brussels. 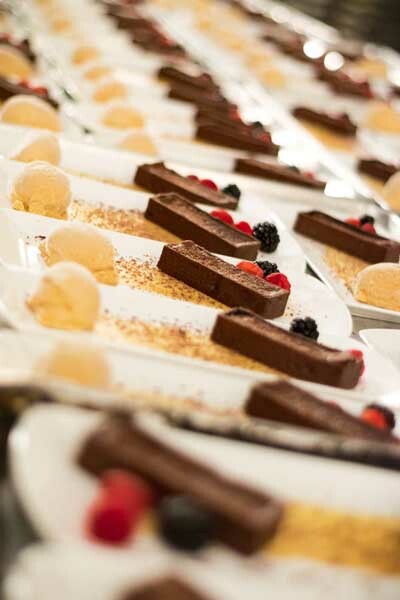 And last, but not least, a dessert of Milk Chocolate Mousse Tart and Dulce de Leche with Bourbon Ice Cream, garnished with Raspberries & Blackberries.